WHAT the . . . . !??!?!?!?!!?!?!? 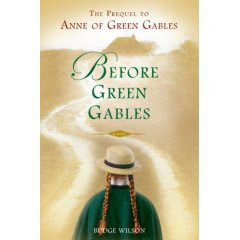 Before Green Gables, by Budge Wilson. What!? Why!? WHY do we have to do this?! I can't say what I really want to say because this is a polite blog. So I'll have to remain (mostly) speechless. Let me just say that there was only ONE Lucy Maud Montgomery and while I agree that she didn't write enough (20 novels, 12 short story collections, 2 books of poetry and 1 piece of non-fiction I haven't been able to get my hands on) we should NOT try to "make up" the difference. If she didn't bother to say it about her own characters then it is quite better left unsaid. Plus, if it's at all true to the backstory, it has to be really depressing--a series of abusive foster homes and orphanages. Joy. Wow... I suppose they feel the same need that so many feel about Austen's novels. Is it really necessary to have a sequel, prequel or any other such version of Pride and Prejudice? And of course we could go on about the sequels and other point of views for Gone with the Wind.... yeah... nuff said. Okay, I know this is terrible, but I'm curious about this now. Do you still have the book and would you be willing to loan it to me? Call it morbid curiosity. More often than not, it gets the best of me! I merely heard about it online. I would NEVER own such a thing.